Sound financial advice during your divorce can help ensure a fair settlement that will help you get off to the best possible start in your new life. After divorce, you may need help adjusting to your new circumstances and projecting your financial well-being into the future. Who are the financial professionals whose help you might benefit from in your divorce? An accountant, a Certified Public Accountant (CPA) in the USA and a Chartered Accountant (CA) or Certified General Accountant (CGA) in Canada, can help with many of the financial aspects of divorce. He or she can calculate net worth for you and your spouse, advise you regarding financial statements, and help in the planning and preparation of income tax filings. A qualified accountant can make judgments regarding the quality and reliability of a company’s books and records – which can be very helpful in divorce cases involving a family-owned business. A professional with this designation has credentials that include managing business accounts. If you need to know how much a business is worth, a CBV can help you. 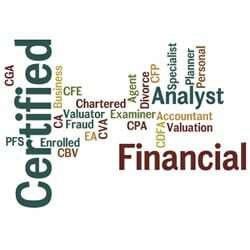 A Certified Divorce Financial Analyst may also be an accountant or financial planner, but the CDFA designation indicates that this professional has specialized education, skills, and experience in the analysis of both the short- and long-term financial impact of different divorce settlement options. CDFAs receive special training in divorce-related financial issues such as tax and property division. The CFE deals with complex financial situations, looking for hidden cash and financial manipulation. If you suspect your ex of foul financial play, this expert can help set things straight. This professional addresses your overall financial health and can help you optimize your finances, identify your future goals, budget and plan for achieving them. A CFP can help you invest any lump-sum spousal support or equalization payment from your divorce to help secure your financial future. This designation identifies a professional who can place a value on a business. An Enrolled Agent has been authorized by the IRS to specialize in tax issues in the USA. This designation is given out by the American Institute of Certified Public Accountants to those who are already Certified Public Accountants and who have at least three years of experience in dealing with personal finances. A PFS can help you improve your tax situation – and your financial future.